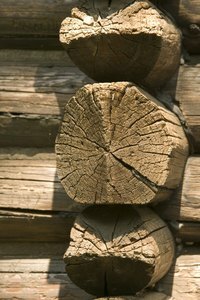 You can have the rustic look of log cabin walls even if you don't live in such a house. Interior log siding are panels of rounded wood connected using a simple tongue-and-groove system that give any room that cozy log cabin feeling. Measure your room and cut all logs to the necessary dimensions. The vertical corner logs should be one inch shorter than the height of the ceiling, while each piece of siding needs to be short enough to fit between two corner logs when installed. Screw a vertical log into each corner, positioning them with half an inch of space both above and below. Drive the screws in close to the parallel wall, so the horizontal siding will obscure them when installed. Nail half inch wood shims at the base of the wall and slide the foundation log into position on top of them, tongue-side pointing upward. Use a stud-finder to locate your wall's wood studs and screw the log to them, positioning the screws near the bottom edge of the log. Drive nails diagonally through the top of the log and into the studs at regular intervals for added stability. Slide the next log into place, fitting its slot over the tongue of the foundation log and covering the lower log's nails. Use a block to tap it until it fits tightly if you have trouble sliding it down all the way. Nail this log along the top as well, positioning the nails to match the wall's studs. Continue adding logs, one on top of the other, until you reach the ceiling. If your wall is wider than the logs are long, cut a second log to length of the gap and slide it into place, tapping it down with a block. Slide it over slightly with a chisel inserted between the end of the log and the corner, tightening the seam between the two logs. Follow the same process for all other walls. You should first compare your log dimensions to the wall dimensions in order to design where the short pieces, if any are going to go.